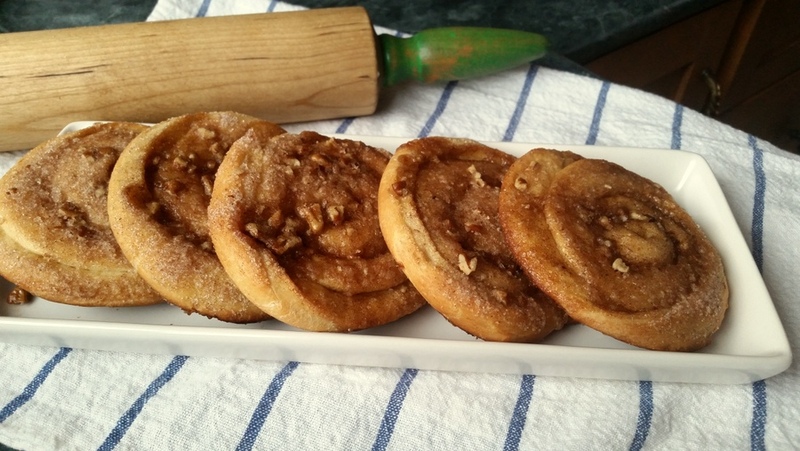 It's been years since I baked these cinnamon crisps. I had forgotten about them until recently when I came across the recipe. They are crispy on the outside and soft and chewy on the inside. Make sure you have time to enjoy one or maybe two of these when they come out of the oven, you will not be sorry. Delicious with a cup of coffee. In small saucepan, heat milk, sugar, shortening, and salt just until shortening melts. Whisk in beaten egg. Mix 3 cups flour and yeast, and together with the liquid ingredients, beat on low speed of mixer for 30 seconds, scraping the sides of the bowl, adding 1/4 cup remaining flour as needed. Beat 3 minutes at high speed. Place in a greased bowl and allow to rise until doubled in bulk, 1/2 hours. Divide dough in half. Roll out each portion to 12" x 12". Spread with Cinnamon Filling and roll up jelly roll style, pinching edge to seal. Cut each roll into 12 equal pieces. Place 6 on parchment lined cookie sheet and using rolling pin, flatten each to 1/8". Repeat with the rest. Allow to rise 30 minutes. Cover cinnamon rolls on cookie sheet with waxed paper and flatten once again with rolling pin to about 1/4". Brush each roll with butter and sprinkle Cinnamon Topping over the top. Cover again with waxed paper (I re-used waxed paper) and roll flat. (1/8") Bake immediately in a 400º oven for 12 minutes. They taste best hot from the oven. Mix together sugars, cinnamon, and melted butter until crumbly. these are new to me and they sound wonderful! This is a great recipe, I am going to try it out. I really love your blog and all your recipe ideas. We've always called these elephant ears, but we make them bigger...about 9" across. 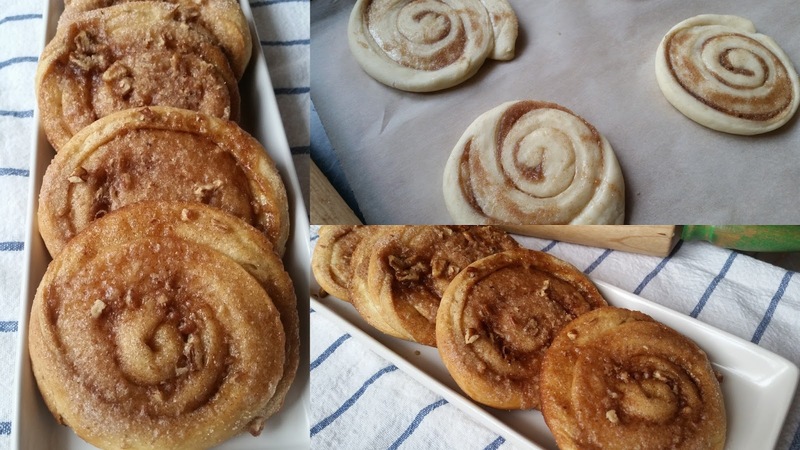 This is such an interesting cinnamon roll recipe - sort of like a yeast dough cookie? They sound absolutely delicious! Hello! Just wanted to let you know I made these over the weekend and they turned out wonderfully! I halved the recipe (because there's just two of us) and now regret it because they're all gone! For my halved recipe I used the whole egg and I made the dough in my bread machine - I also omitted the white sugar from the filling and just used only the brown - and I also sprinkled the walnuts on the dough before I rolled it up - I did not use the topping but instead I brushed them with warm honey and melted butter before baking - YUM - they do freeze well - many thanks for another super recipe!